Greek salad is an incredibly delicious salad to serve as a side dish, but thanks to its cubed feta cheese, mixed olives and chunks of fresh cucumber it’s substantial enough to serve as a main meal for lunch too. Greek salad is seriously FODMAP-friendly because as long as you keep to the recommended amount of feta and pomegranate seeds per portion it’s very low FODMAP. In fact, if you’re highly intolerant to fructose you can easily leave the pomegranate seeds out without massively affecting the overall taste of the Greek salad. Also, if you’re dairy intolerant or allergic to dairy you can replace the feta cheese with a dairy-free version if you like. 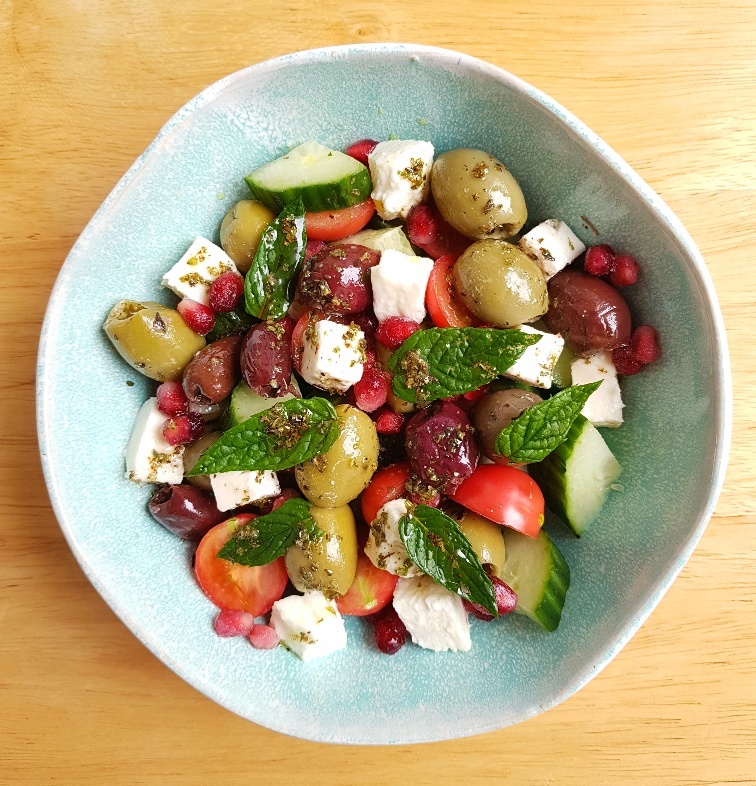 Taking into consideration that this Greek salad is ‘just’ a salad, it’s actually very filling and satisfying, its individual components coming together to blend into a harmonious bowlful of very refreshing ingredients. This Greek salad sees mixed black and green olives paired with crisp cubes of cucumber, sweet, tangy tomato wedges and salty, creamy feta cheese, all of which is tossed in a fresh, tart vinegarette made from olive oil, red wine vinegar and oregano. It’s a timeless salad which you will welcome at any time of the day. Prepare the ingredients as directed and then place them in a bowl. Mix the olive oil and red wine vinegar with the oregano and then drizzle it over the ingredients in the bowl. Decorate with the pomegranate seeds and mint leaves and serve.